Inspired by origami masters and the beauty of geometric designs, my mom ditched traditional paper origami and took the art to her native medium: fabric. A professional in the sewing industry, she was not daunted by the challenge of origami fabric folding. And she succeeded: above you can see the iso area origami flasher she made. It starts at just two or three inches in diameter and expands to about twelve inches on each side. When released, the origami flasher springs back to the small, folded position. 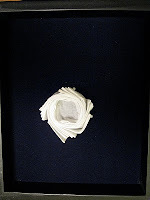 Iso area patterns are complex and making an origami flasher with fabric brings its own challenges: the fabric must be sturdy, and you must find a way to make it maintain a fold. Ironing and starching would require a tiny iron, incredible precision, and wouldn't be permanent; sewing small fabric strips together would be tedious and error-prone considering the dozens of tiny seams involved and the varied folds they must make. To overcome these difficulties, my mom used a technique called "pin-tucking" that uses a double needle and mismatched upper and lower thread tension to create a natural fold wherever the needle lays a path. 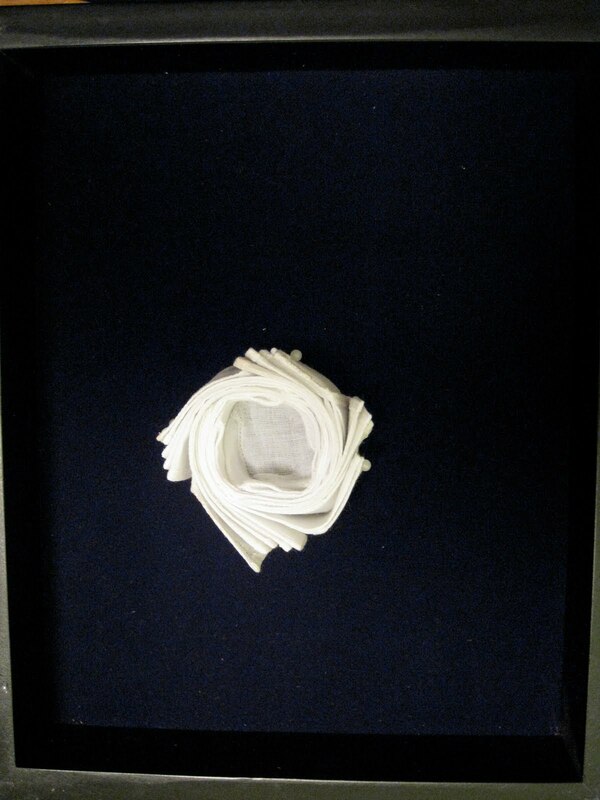 If you have the equipment and skills, origami fabric folding using pin-tucking will serve you well. She used a stiff cotton organdy to make the iso area design. 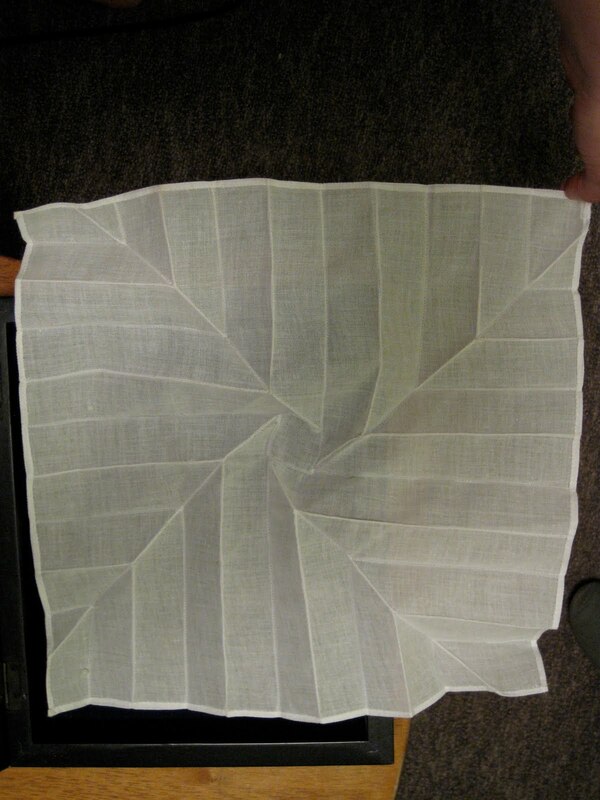 This fabric is commonly used to make a traditional Dutch hat costume, and it seems to work well for origami fabric folding when using pin-tucking. 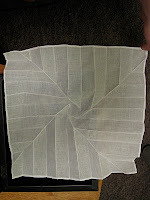 This iso area pattern is very close, if not identical, to a pattern called an "Iso Area Flasher," designed jointly by origami artists Chris Palmer and Jeremy Shafer. The pattern itself made its way into my mom's shop on a piece of printed paper via a talk she heard by American physicist and renowned origami artist Robert Lang. The origami flasher pattern's name comes from its ability to "flash" from an extremely compact folded state to a large size, and is based on the work of Japanese origami artist and theorist Toshikazu Kawasaki's iso-area fold patterns. "Iso area" refers to "iso area symmetry": symmetry that is rotationally inverse and where folds are in alternating directions. Did you like hearing about this origami flasher project? If so, let me know!